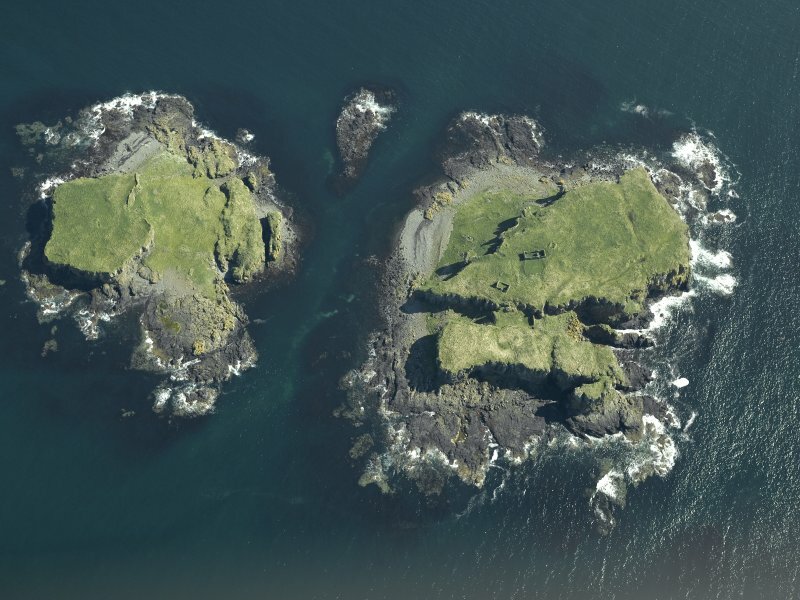 General oblique aerial view of Treshnish Isles, looking SW.
Oblique aerial view of the islands centred on the remains of the castles, taken from the SSW. 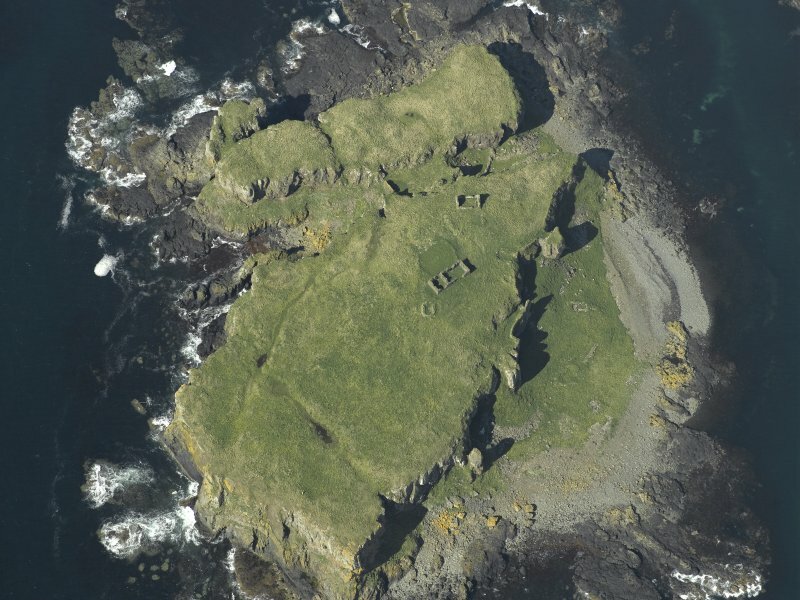 Oblique aerial view centred on the remains of Cairn Na Burgh More Castle, taken from the West. 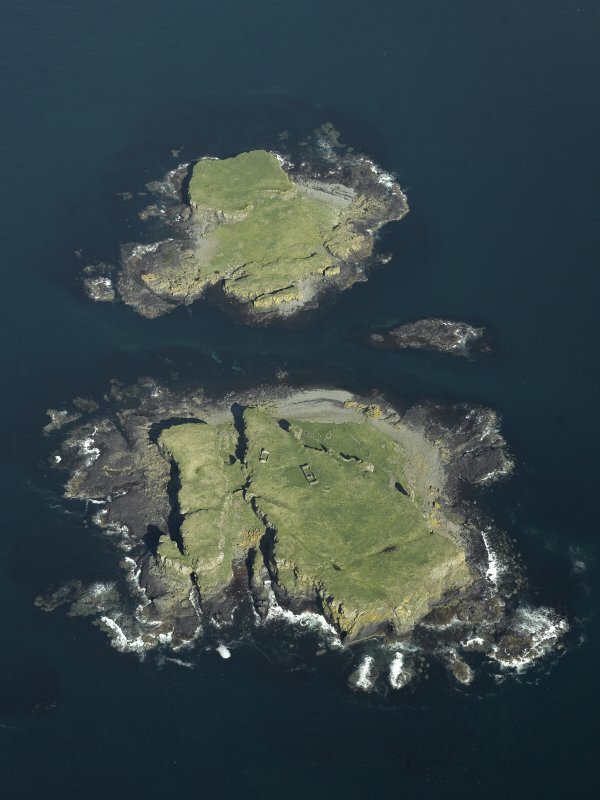 Oblique aerial view of the islands centred on the remains of the castles, taken from the NW. View of barrack from South-East. View of chapel from North-East. 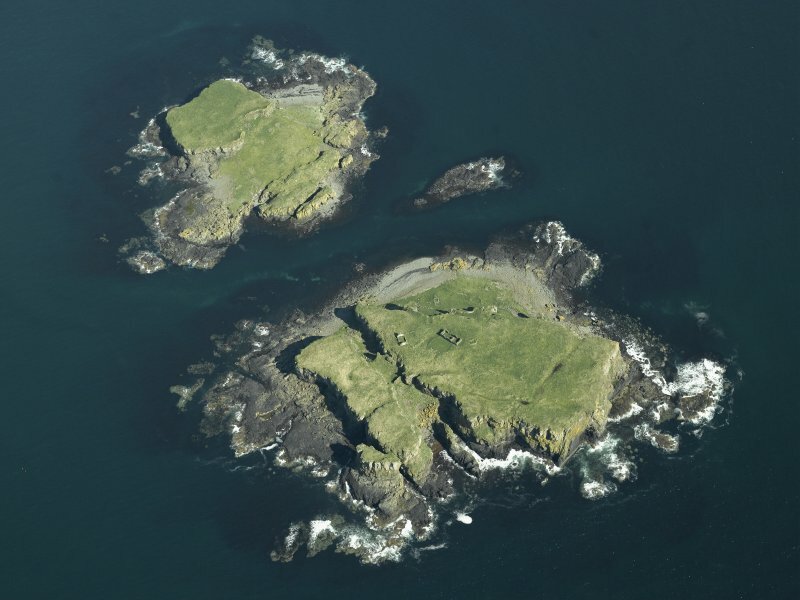 General oblique aerial view of Treshnish Isles, looking NW. 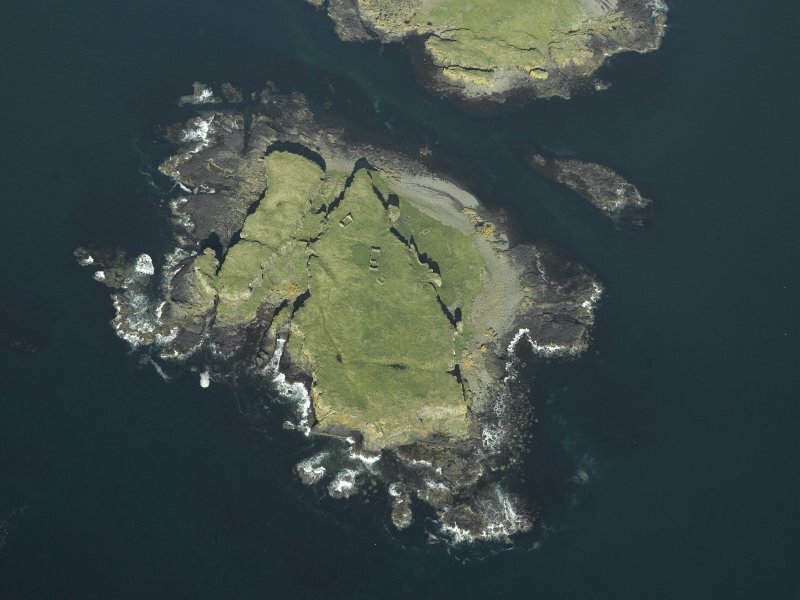 General oblique aerial view of Treshnish Isles, looking NE. 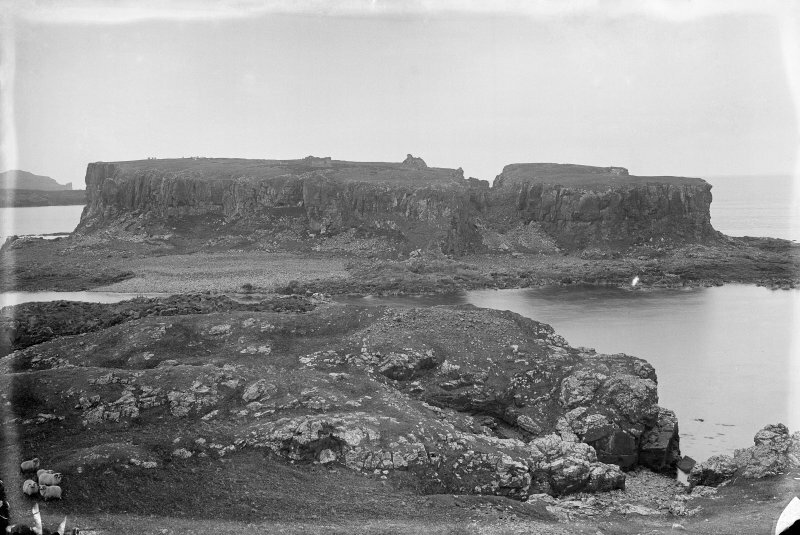 View of Cairn Na Burgh More Castle, Treshnish Isles. 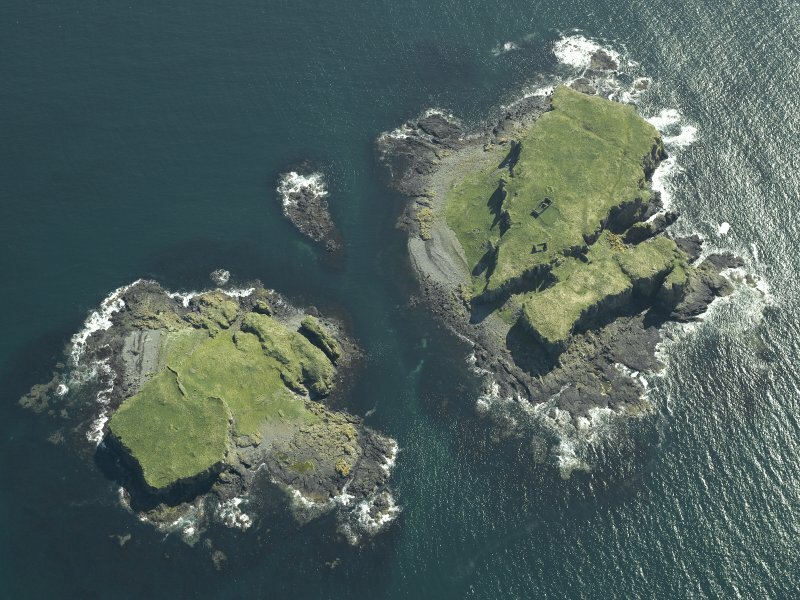 Oblique aerial view of the islands centred on the remains of the castles, taken from the N.
View of curtain wall from South. General view from the south. 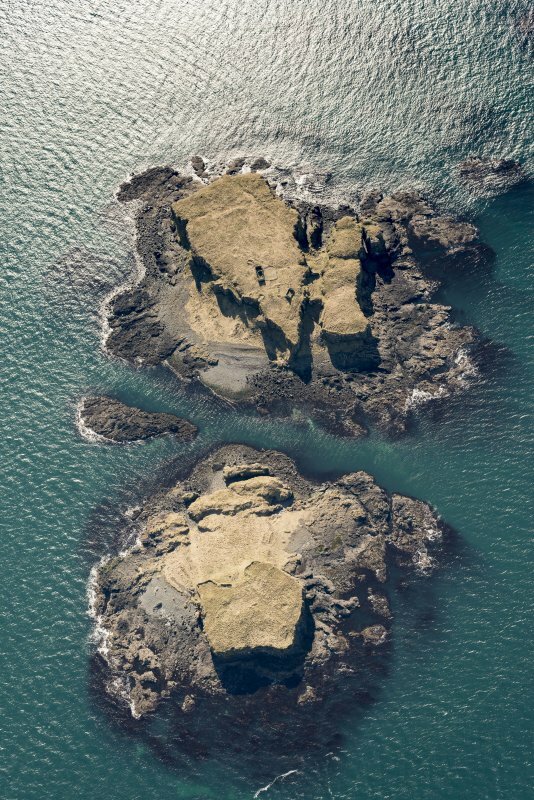 Oblique aerial view of the islands centred on the remains of the castles, taken from the WSW. 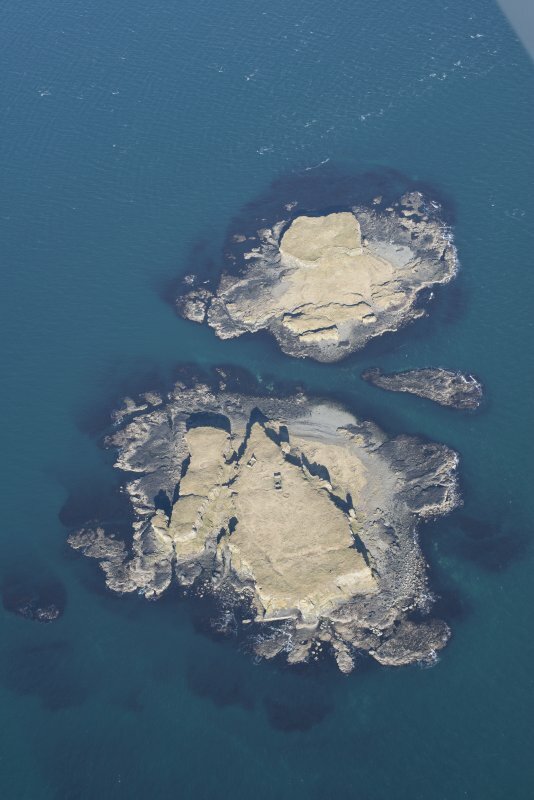 Oblique aerial view of the islands centred on the remains of the castles, taken from the W.
View of interior of entrance. See also NM34SW 2 (Cairn na Burgh Beg). 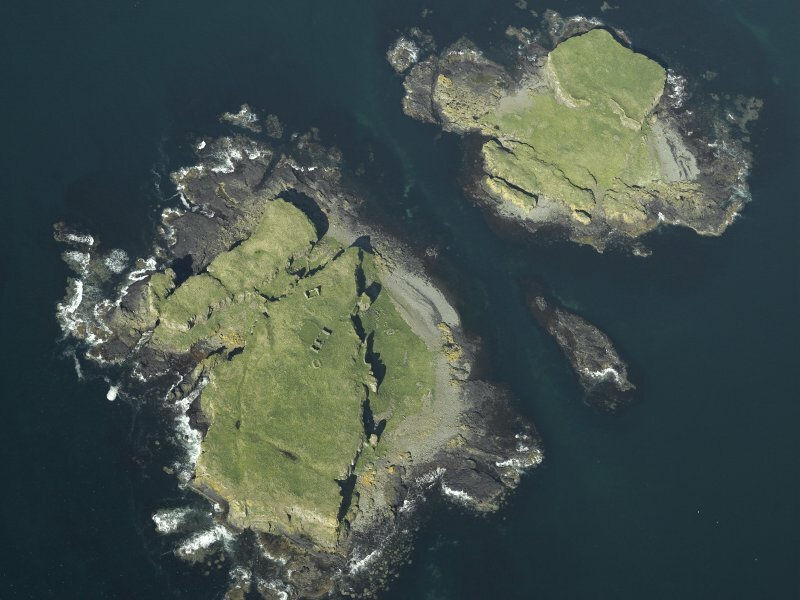 Cairnburgh Castle: This castle occupies the adjacent islands of Cairn na Burgh More and Cairn na Burgh Beg, lying at the NE end of the Treshnish chain. 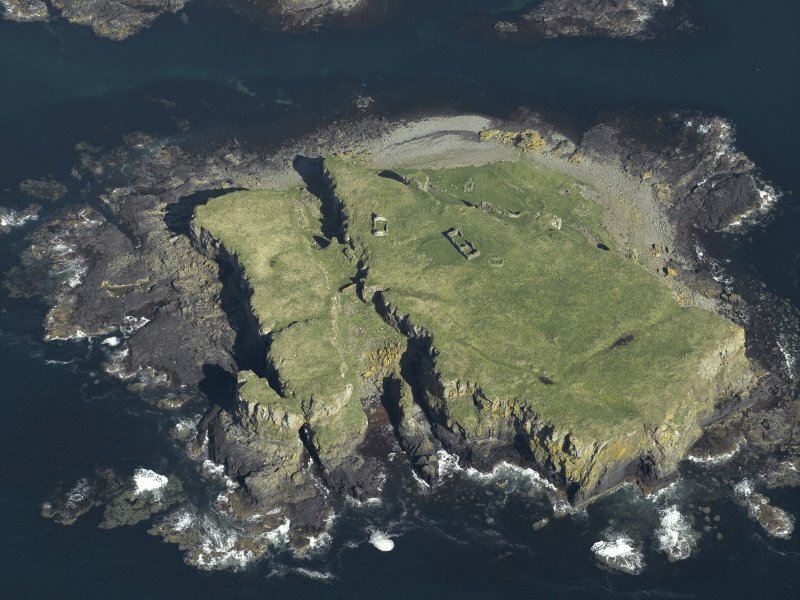 The main part of the castle is situated on the larger of the two islands, namely Cairn na Burgh More, the smaller one probably having been fortified largely to secure the approach to the principal stronghold. 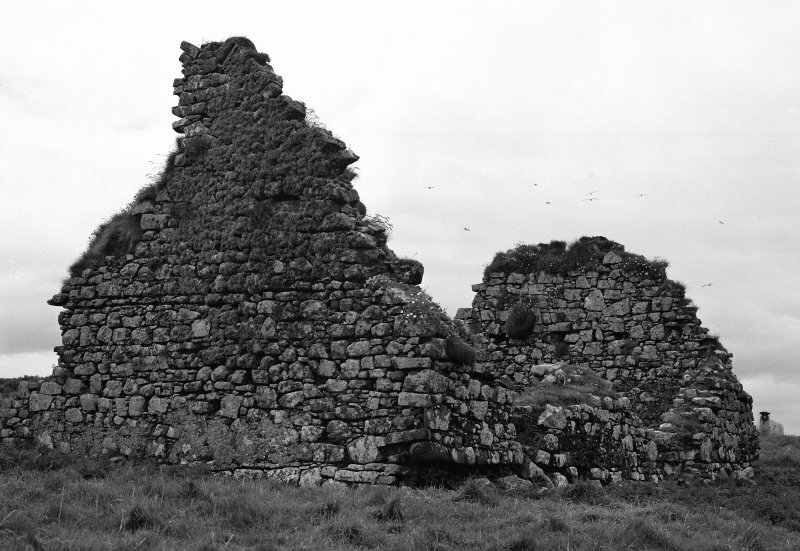 Apart from the chapel on Cairn na Burgh More, which may be as old as the 15th century, all the surviving buildings, including the curtain-walls, appear to be of 16th- or 17th-century date. (See NM34SW 2 for a description of the remains on Cairn na Burgh Beg). 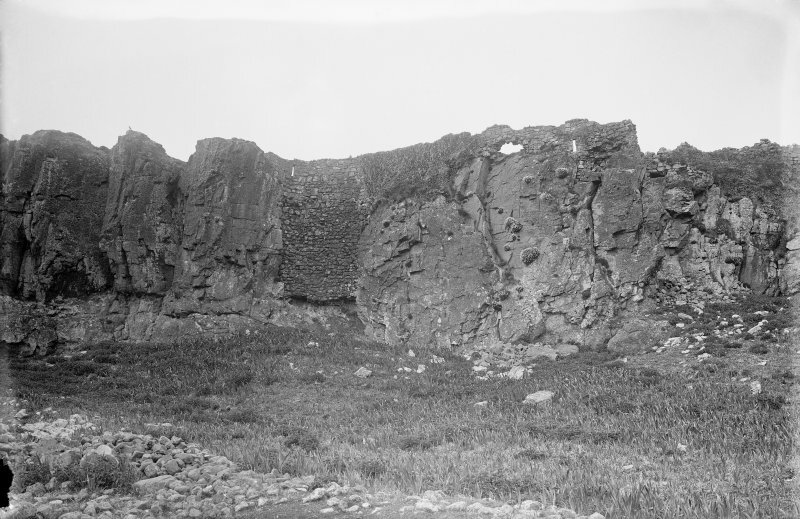 Cairn na Burgh More is divided into two portions of unequal size by a deep gully running approximately from W to E. The castle stands on the larger (S) portion (see plan), which comprises a gently sloping summit some 1.36 ha (3.4 acres) in extent situated up to 34m above sea-level. 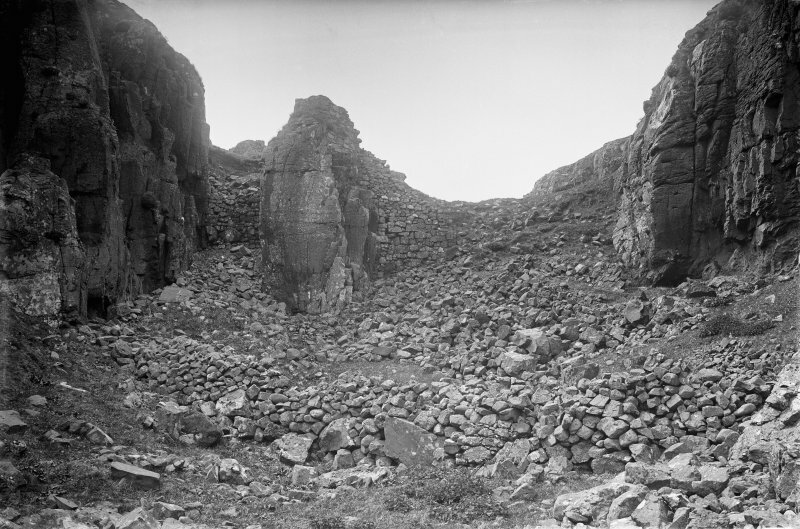 On the NW, W and SW sides, sheer cliffs make ascent impossible, and the remaining sides, where the cliffs are lower and less steep, have been enclosed by a curtain-wall, of random rubble masonry laid in lime- mortar. This varies the thickness from 0.60m to 1.40m and is best preserved on the E side, where it rises to a maximum internal height of about 2.5m. It follows a sinuous course, following the cliff-top. Natural clefts in the rock have been sealed off by carrying the wall down to the base of the cliff. Two short stretches are of dry-stone masonry. The best-preserved buildings are the chapel and the barrack, both of which stand partially to wall-head level. The former measures 7.9m from E to W by 4.9m transversely within walls some 0.7m in thickness; on its S side there is a small enclosure surrounded by a dry-stone wall. The barrack, two storeys high, measures 16.2m from SW to NE by 6.3m transversely over walls 0.7m in thickness. A little NE of the barrack are the remains of a small oblong building identified on a mid-18th century Board of Ordnance plan as a guard-house. This measures 7.9m by 6.4m over dry-stone walls some 1.5m in thickness. There appears to have been a doorway on the S side, facing towards a small adjacent building of sub-oval plan not indicated on the Board of Ordnance drawing. To the SE of the barrack are the remains of two other dry-stone buildings, the smaller of which is identified on the Board of Ordnance plan as a 'house for fireing' or fuel-store. The only other structures on the island are a group of three or four dry-stone buildings of sub-rectangular plan lying immediately above the foreshore and close to the principal entrance, but these may be of comparatively recent origin. About 75m SW of the barrack, a shallow drainage-trough of natural origin runs across the summit from NW to SE. 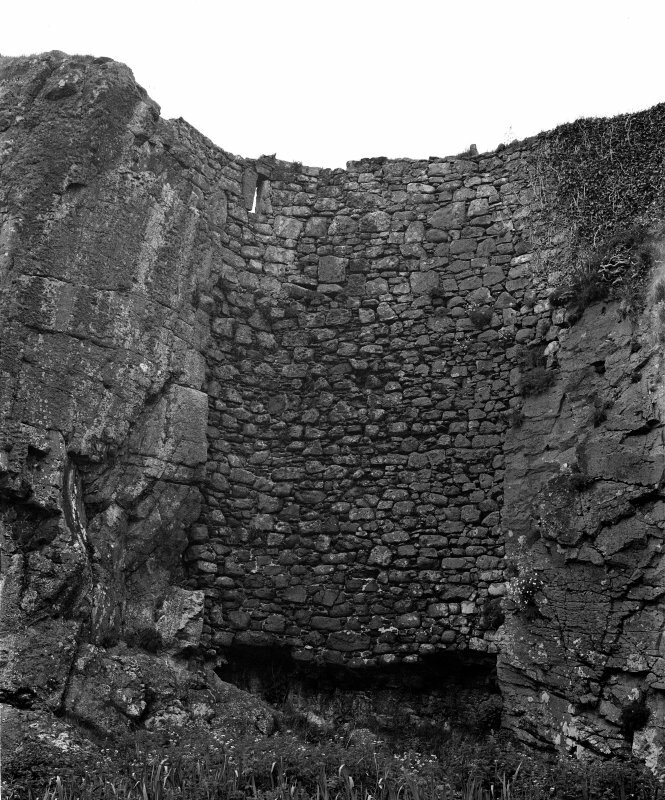 The central portion of the trough has evidently been converted into a catchment pool by the construction of an earthen dam across its lower end, and the Board of Ordnance plan shows that this pool served the garrison as a well in the 18th century. 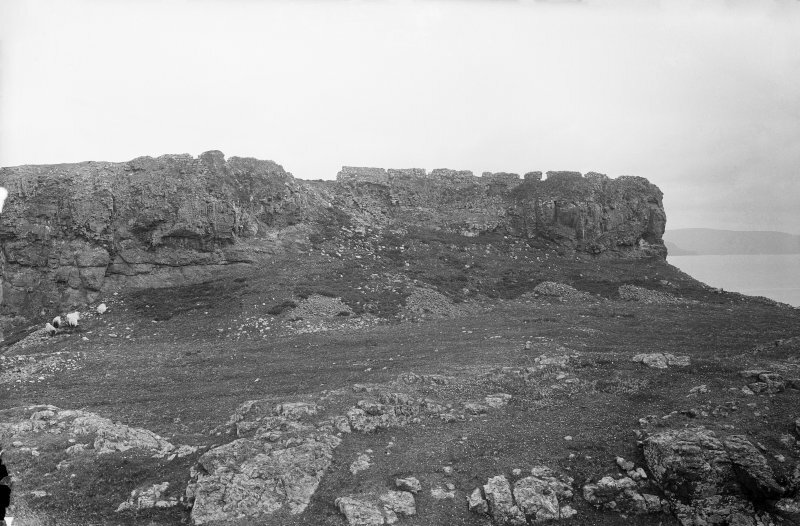 The castle of Cairnburgh, or Kiarnaborg, first comes on record in 1249. 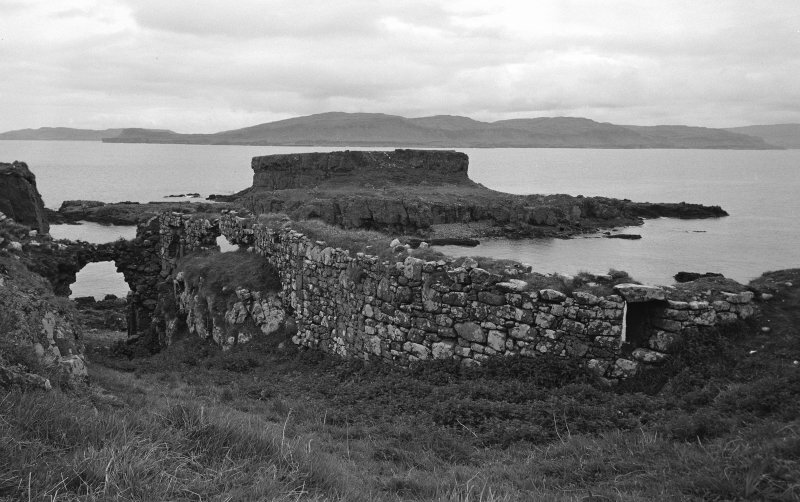 It changed hands on numerous occasions (detailed by the RCAHMS) before being captured by General Leslie in 1647; possibly some of the existing defences of the castle date to this period. It appears to have been occupied by a permanent government garrison following the Jacobite Rebellion of 1715. The remains of this castle are generally as described. Three unroofed buildings, one of which is annotated as a Castle, are depicted on the 1st edition of the OS 6-inch map (Argyllshire, Island of Mull 1881, sheet lxvi) and on the current edition of the OS 1:10000 map (1975). NM 305 448 A standing building survey of the barracks, chapel and curtain wall on Cairn na Burgh More, Trehsnish Islands, was carried out on behalf of the Hebridean Trust in August 2006. This project was undertaken in order to assist with the conservation and restoration of the structures and to assess the archaeological potential for further archaeological works. The work also included an evaluation of the site of a new light to be constructed by the northern Lighthouse Board at the southern tip of the island. The evaluation established that there were no archaeological features in the footprint of the light and so no further work was required. 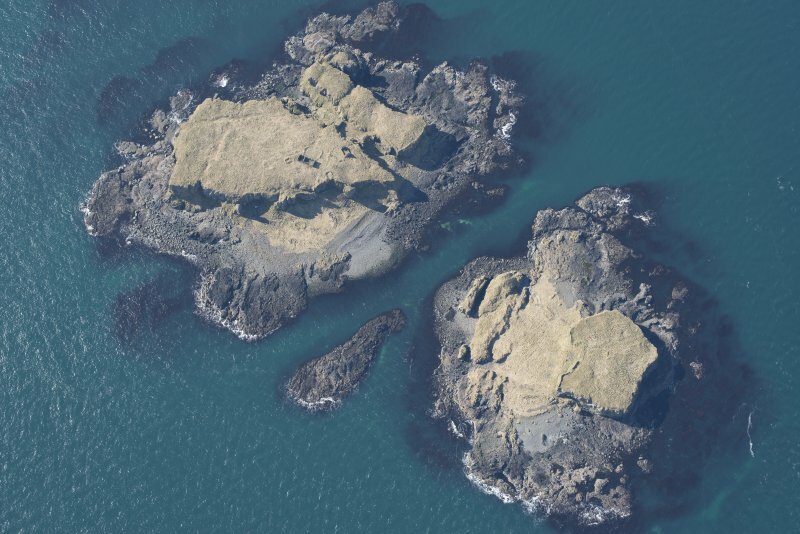 This survey has highlighted the important strategic position held by the Treshnish Isles, and Cairnburgh Castle in particular, until the mid-18th century and has recorded the state of preservation of the diverse types of monuments that survive on the island. Archive to be deposited in NMRS. Report to be lodged with WoSAS SMR and NMRS. Information from Historic Scotland, scheduling document dated 19 July 2011.